As I continue sifting through our performance data, I’ve been focusing lately on outdoor temperatures and their relationship with our heating and cooling energy use. These are a few of my observations. We have 9 months, 274 days, 6,576 hours of temperature data, from February 1 to October 31. Of those 6,576 hours, 4,635 outdoor temperature hours were below 68 degrees F. Roughly 70% of the recorded time period has been below 68 degrees F.
Breaking out the temperatures by 10 degree buckets you can see a rough bell curve. The majority of hours were in the 60-70 degree F range. The next three months of data will add more hours to the 60 degree and below buckets. 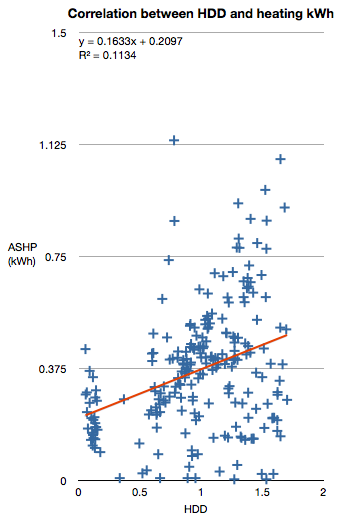 If we overlay air-source heat pump values on the same chart (below), we can see the power used for heating and cooling based on the temperature ranges. The dip in the 50-60 degree range is likely to indicate our base building temperature. The dip is where we shift from heating to cooling or dehumidification in our case. I really should plot the right side with interior humidity ranges rather than temperature ranges. I’m guessing the hottest days were more dry and less likely for us to use the AC. We used the majority of our heat energy for temperatures below 54F degrees. This makes sense, but when I looked at the hours the heat was on in the two temperature ranges I saw something I didn’t expect. The heat was only ON for for a small proportion of the hours that temperatures were below 54F degrees. It was off more than it was on. After I mulled this over it made sense too. A lot of spring, summer and fall nights can get quite cool, but the insulation and mass of the house keeps it warm through the night. Plus, we generally keep the heat turned off in the summer for obvious reasons. But it made me curious what types of temperature swings we were experiencing monthly. There is quite a range of temperatures throughout the months, March being the extreme due to a freakishly warm spell. The dotted line is 68F. This shows we’re getting some cool nights all through the summer. Heat was ON 6% of the total hours that temps were below 68F. In that time we used 91.941 kWh for heat, an average of 334 Wh/hr. Heat was ON 14% of the total hours that temps were below 54F. In that time we used 77.81 kWh for heat. 82% of total heat usage, an average of 399 Wh/hr. Heat was ON 4% of the total hours that temps were between 54F and 68F. In that time we used 14.131 kWh for heat. 18% of total heat usage, an average of 177 Wh/hr. I spent a few of the Sandy storm days indoors and decided to indulge my inner nerd. I’ve been tracking all our house performance data using monthly spreadsheets, which can make it difficult to filter data or look for trends across months. So I downloaded mySQL and imported all our energy and temperature data into the database. This is the first in a series of posts on what I find as I sift through the data. A while back I stumbled upon this article, Linear Regression Analysis of Energy Consumption Data. At the time I was learning about how to calculate HDD days based on our own temperature data captured by our outdoor HOBO temperature and humidity sensor. Now that our data is much easier to query I decided to give the linear regression analysis a try. The main idea is that if we plot energy used to heat our house on one axis and HDD on the other (and we’re extremely lucky) we should be able to see a fairly consistent pattern. Meaning we could use the results of the analysis to predict how much energy will be required in the future if we know the probability of HDD for a future time period. The R2 value of 0.1134 in the chart at the top of the page tells us that we don’t have a strong correlation between energy use and HDD. The closer the R2 value gets to 1, the stronger the correlation. So what could be the reasons that we don’t have a stronger correlation? One reason may be that an air source heat pump uses different amounts of energy to make heat depending on the outside air temperature. It has to work harder at lower temperatures to generate the same amount of heat. It may also have something to do with how the HDD values are selected. I started with daily snapshots, but there could be 23 HDD in a 24 hour day, and the ASHP only operated for a few of those hours, either because we turned it off at night or we experienced a day with a lot of sun. So I switched to hourly snapshots and discarded any hours where the ASHP was not drawing power (the result is the chart at top of page). This however, did not result in a closer correlation. My guess is that we don’t use the heat in a consistent manner so we’d have a difficult time getting a strong correlation. Plus, the way the heat pump itself works may also make it difficult to correlate. October was overshadowed by the events of the last week. Despite the best efforts of Hurricane Sandy we are safe and dry at Up Hill House. We had plenty of strong wind gusts, but not nearly as bad as the costal regions. We were prepared for the worst. We stocked up on water and easy to prepare meals. We have a small propane burner that can be used to heat water or simple cooking. We packed the chest freezer with ice. We filled the bathtub for flushing and the cistern was full for the farm critters. Thankfully the power never went out. October was considerably more cloudy. 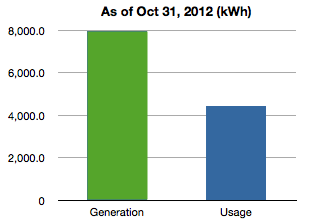 We only generated 511 kWh, down 73% from September, but still about 43 kWh better than predicted. We used 433 kWh, our highest month since March. That’s up 48% from the previous month. We turned on the heating for a 27 hour stretch starting on October 3rd at 3pm, although I can’t remember why. It wasn’t particularly cold inside or out. We used a total of 6.3 kWh for those 27 hours. That only accounts for 1.5% of our month’s total usage. The big increase was due to washing dishes, cloths and cooking (256 kWh versus 164 kWh the previous month). I like to refer to this as the mother-in-law effect. Unfortunately we were not able to use the clothes line this month due to lady bug beetle swarms. Despite the lower solar generation and the higher usage, we still managed to squeak out a 78 kWh surplus this month, our 8th surplus month in a row, and likely our last for the year. We’re still on track to produce more than we use in our first year. The number of hours we experienced temperature values below 68F increased to 446 HDD, slightly milder than average for October in our area. Our water usage increased this month, due to extra wash loads and additional water we stored in case we lost power during Sandy. We averaged 65.6 gallons per day. I put this chart together for the Green Building Open House Tour. I wanted to show in dollars, how much power we’ve used and how much we’ve generated since we moved in at the beginning of the year. 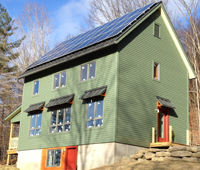 As of the end of October, we’ve used 4,434 kWh and generated 7,939 kWh. At roughly $0.15 per kWh that works out to $665 in electricity usage versus $1,191 for electricity produced. Of course we don’t get 15 cents a kWh when we sell it back to the grid, but it illustrates that we’re accumulating value faster than we’re spending it over the year. You can see heat maps and detailed charts of temperature and electrical usage at netplusdesign.com. View solar, usage, net usage, temperatures and HDD for all of February and circuit-level data for 16 days in March and the full months of April through October.